A singular building, the Circular Pavilion has nothing round. The name describes the process, which follows the circular economy principles, according to which ones’ waste become others’ ressources. 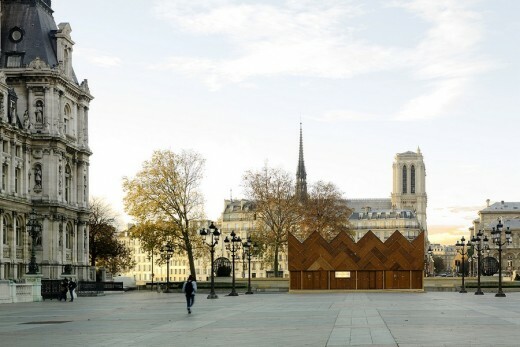 Faced with the depletion of natural resources and aims for the «Zero Metropolis Waste» ambition, this pavilion demonstrates the potential of re-use in architecture, which fits in the context of COP 21 (the 2015 United Nations Climate Change Conference) in Paris. About 60% of the implemented materials here finds a second life. Wastes taken from construction sites, erroneous orders or unused stocks : each of the materials implemented has its own story. 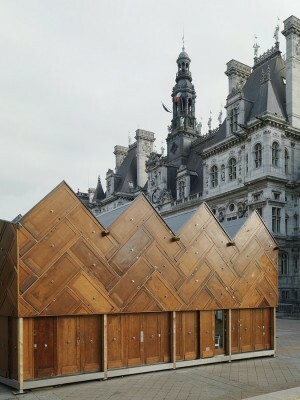 180 wooden doors, deposited during a housing rehabilitation operation in Paris’ 19th district, form the facade. Inside, the isolation uses mineral wool removed from a supermarket roof. 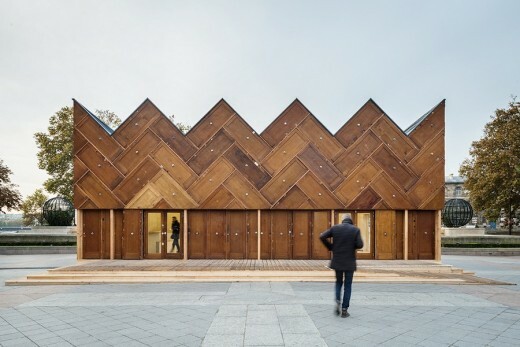 The wooden framework is made of extras from the construction site of a retirement home while the ground and the partition walls consist of former exhibition’s walls. Outside, the terrace is built with the wood of Paris Beach event. 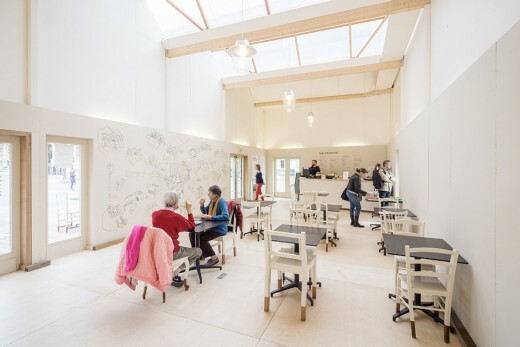 When it comes to the furnitures, 50 wooden chairs were collected from Parisian bulky waste, fixed and painted, and the hanging lights come from the public lighting storage. 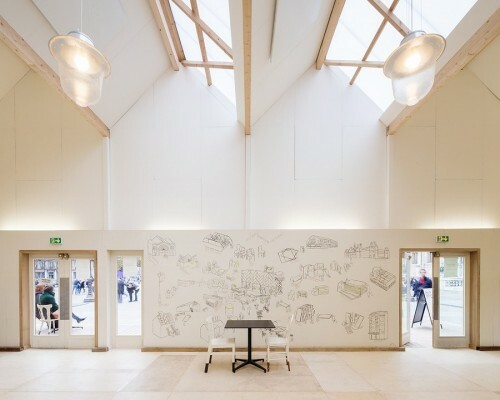 At the exception of the framework and impermeability, all the work was done by the technical services of Paris City Hall. With this experimental process, we wanted to demonstrate that access to new materials deposits rely on new relationships with the ones in charge of deconstructing and dismantling buildings, the ones who salvage and implement materials. An improved focus on the already existing resources and materials would allow to reduce our consumption of primary resource as well as avoid the production and accumulation of wastes that then need to be dealt with. It an ongoing research toward an architecture characterized by sobriety and pertinence. 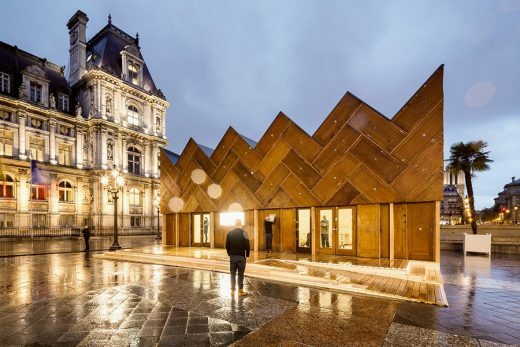 While implanted on the parvis de l’Hôtel de Vill, the pavilion will host exhibitions, workshops, lectures and debates. 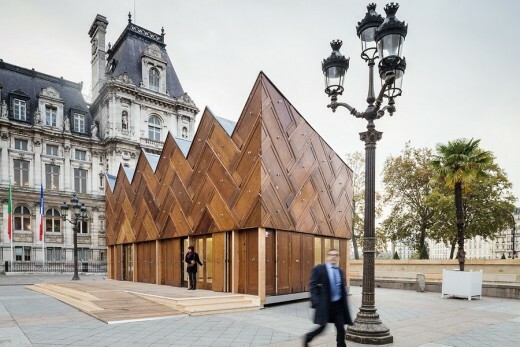 At the beginning of year 2016, the Circular Pavilion will be dismantled and reinstalled permanently in Paris’ 14th district as a sports association’s clubhouse. Tower building located in ZAC Seguin rive de Seine, Boulogne-Billancourt.